You can connect up to five CTS Sentinel instruments at a time using the QualityWorX CTS DataHub turnkey solution or use the QualityWorX CTS Data Connector to aggregate data in a QualityWorX database for more extensive data collection requirements. The Sentinel C28WE pressure decay or vacuum decay instrument is Cincinnati Test System’s latest addition to the technologically advanced Sentinel leak test instrument family. The C28WE utilizes test algorithms processed on an advanced 32-bit system, giving it fast and repeatable results in a more compact package. Data resolution 0.00001 psi/ and scc/m. CTS and Sciemetric have now made it possible to collect, store and analyze data from a selection of CTS instruments using QualityWorX. 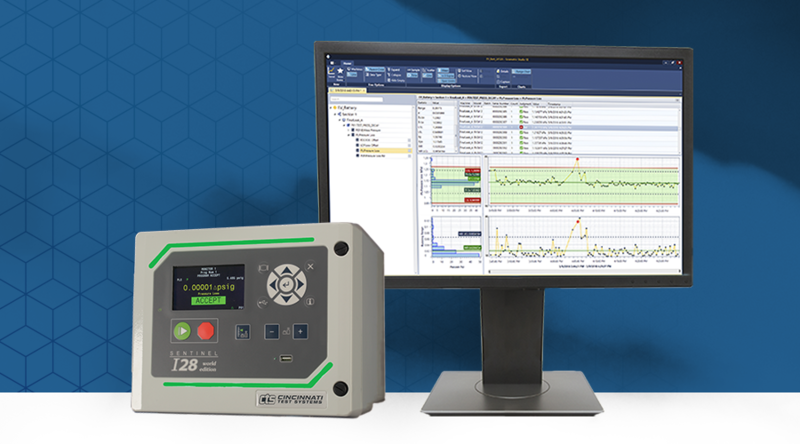 Customers can now connect several CTS Sentinel C28 instruments at a time using the QualityWorX CTS DataHub, a quick and easy turnkey platform for collecting and analyzing data, without requiring complex IT support or set up. Want to collect data from more CTS instruments or to aggregate leak test information with data from other tests? Scale up to a QualityWorX database solution to cover as many stations as you need. Learn more about QualityWorX. Current QualityWorX customers can now add CTS Sentinel C28 data to their database! Contact your sales representative to talk about connecting Sentinel C28 instruments to your QualityWorX database.